January 31, 2018 – It’s not just a lunar eclipse, it will also be a blue moon and a supermoon all in one! January has two full moons, called a Blue Moon; the first was on January 1. A super moon, like the one visible on New Year’s Day, is when a full moon is closest to the Earth in its orbit, appearing bigger and brighter than normal. The red moon name arises because a full moon nearly always appears coppery red during a total lunar eclipse. “The exact color that the moon appears depends on the amount of dust and clouds in the atmosphere,” according to NASA scientists. The January 31 full moon, the third full moon in a series of supermoons, will pass through the Earth’s shadow in North America before sunrise on January 31, 2018 and you will see a total lunar eclipse. When the eclipse is in totality the moon will be completely covered by Earth’s shadow. The entire show will last approximately one hour and fifteen minutes. Lunar eclipses are among the easiest skywatching events to observe. Simply go out, look up and enjoy. You don’t need a telescope or any other special equipment. If you already have binoculars or a small telescope they will bring out details in the lunar surface — moonwatching can be really fascinating. Can you find Marilyn’s Mountain, as quoted by Jim Lovell in the movie Apollo 13? This eclipse occurs during the winter, so bundle up if you plan to be out for the duration. Bring warm drinks and blankets or chairs for comfort. If you have young children and can’t sit through the entirety, the best part of an eclipse is during the middle of the event, when the moon is in the umbral shadow. 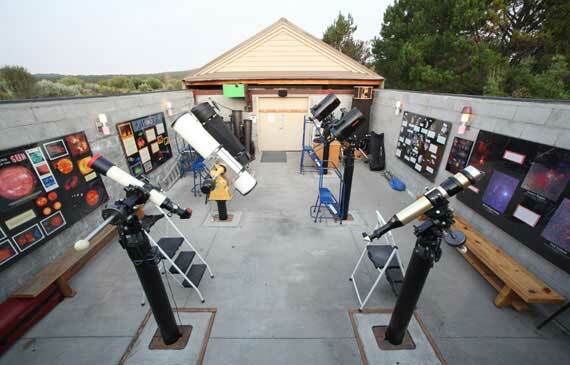 The Oregon Observatory (Sunriver Oregon) plans to be open, weather permitting, from 3:30 am until just after 6:00 am. Call the Observatory at 541-598-4406 for the most current update on Jan. 31 viewing conditions.